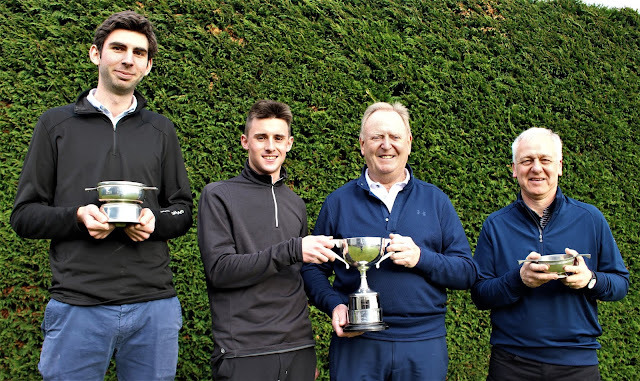 Left to right: Handicap 1 winner Morty Ross, David Grindell, Alistair Thomson with the championship trophy, Davie Walker with Jim Thom Handicap 2 Quaich . After matching his age with a card of 69 at the Torvean fixture last February, retired Inverness Golf Club professional Alistair Thompson, now 70, made an even bigger impact when he captured the North Scottish Alliance Championship at Moray Golf Club last Saturday. On a very windy day, when the expected challenge would materialise from the younger generation who have dominated this season's fixtures, it was senior statesman Thomson who proved he was no back number with a card of of 73 (37-36) to tie the leading scratch score from the field of 100 with the young Inverness assistant professional, David Grindell, and local amateur Darren Pitchforth. Thomson had actually missed a 3ft putt on the final green for an outright win but when the trio returned to the course for the two-hole play-off they all parred the first hole. From the final tee Thomson hit the poorer of the three drives but found the iconic Moray course 18th with a seven iron, the other pair using just wedges for their approach shots. But it was Thomson who rolled in a 20ft birdie putt to lift the Sir Hugh Mackenzie Trophy for a second time, his last win 32 years ago in 1987! Grindell and Pitchforth both parred the last hole to share second place ahead of Jordan Shaw (Boat of Garten) 74, Jonathon Keith (Inverness) and Elgin pro Alan Duncan (Elgin), both 75, while defending champion Jeff Wright (Forres) returned a 76 and the season's aggregate winner, Kyle Godsman, a 77. Three more trophies went west from the Moray venue and one to Spey Valley. Fortrose and Rosemarkie's Morty Ross struggled against the outward half wind, taking a count of 43 to the turn. Then he began his inward nine holes with two bogeys before hitting a purple patch. Four birdies over his last six holes for a one-under-par 35 took his card below 80, one of only 15 players to do so. Ross's gross 78 reduced to net 72 for him to win the Bank of Scotland Quaich from Class 1 in which runner-up Gordon Hay (Boat of Garten) had a net 76. Hay's consolation prize was the J A B Little Trophy for the best scratch score from a senior, a 77. From the Class 2 section, Inverness's Davie Walker took home the Jim Thom Quaich with a net 74. The handicap runner-up was Bill Spencer (Boat of Garten) and finally Torvean's Bob Stewart won the seniors' handicap trophy, the Gourlay Salver, with his net 77 off three of a handicap. 73 A P Thomson(Pro)(Inverness), D Pitchforth (Moray), D Grindell (Pro)(Inverness). J Shaw (Boat of Garten). J Keith (Inverness), A J Duncan (Pro)(Elgin) 75. J Wright (Forres), D Joel (Inverness), M McAllan (Pro)(Elgin). K Godsman (Moray), G H Hay (Boat of Garten), M Wilson (Forres)78. M Ross (Fortrose & Rosemarkie). I Murray (Boat of Garten) 79. A W Mair (Moray), N McPhie (Inverness), R H Stewart (Torvean), T Bell (Pro)(Nairn Dunbar)80. L Reid (Fortrose & Rosemarkie), R Harrower (Pro)(Boat of Garten), K Thomson (Moray), J A Grant (Grantown on Spey). A Henry (Inverness) 84. D Walker (Inverness), A Philip (Inverness), K Mackay (Inverness), D Hector (Elgin), S Wilson (Inverness), J S D Campbell (Grantown on Spey) 85. B J Thomson (Inverness), A Macintosh (Torvean), B Gray (Inverness) 86. 72 M Ross (Fortrose & Rosemarkie)(6) 72. G H Hay (Boat of Garten)(1) 76. N McPhie (Inverness)(3), R H Stewart (Torvean) (3), I Murray (Boat of Garten) (2) 77. Handicap Section Two (8 to 18) D Walker (Inverness)(11)74. W H Spencer (Boat of Garten)(11)77. A McWilliam (Moray)(17) 78. J Greenwood (Inverness)(8)79. J Rogers (Inverness)(9) 80.